The XMB or "Xross Media Bar" is one of the defining strengths of the PS3 console. Clean and deceptively simple, it has a number of functions and options to make navigation easier. The Sony equivalent to the Xbox 360's 'dashboard,' the Xross Media Bar was first put to use on the PSP-1000 at launch and then on all PS3 models. Unlike its Microsoft counterpart, it has gone through a variety of minor updates and modifications without any total overhauls. The ethic of 'if it ain't broke, don't fix it' prevails in the case of PS3 firmware. Simplicity doesn't necessarily equate to ease-of-use, however, the interface can be easy to learn and remain difficult to master. In this section we will cover a variety of related topics, from directory nesting and file management to theme installation and even custom theme creation. The Playstation 3's cross-media bar interface functions on a series of vertical icons that expand into columns for ease of navigation through nested and branched directories. The 'columns,' from left to right, are Settings, Picture, Music, Video, Game, Network, Playstation Network, and Friends. We address most of these columns individually in the sections below. PLEASE NOTE: Some columns, their options, and their form of display have changed significantly since the launch of the PS3 and its firmware upgrades. Unless stated otherwise, the guides below are written with the most current firmware in mind. General XMB Management - General "How to Guide" for the XMB. Firmware History - Listing and breakdown of all major system updates. 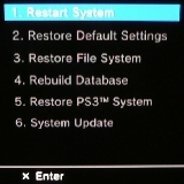 Settings Column - Guide to all settings and functions, plus tips for optimizing your PS3. Network, PSN & Friends Columns - Information on setting up or customizing a PSN account, navigating the Playstation Store, Friend Settings, and functions of the PS3 web browser. Game Column - Methods of sorting and organizing installed games, managing and backing up save files, and functions of the virtual memory cards. Video, Music & Picture Columns - The three 'media' columns of the XMB operate under many of the same rules. This section addresses both general functions and column-specific functions, including managing files and importing them from external drives or discs.